There are thousands of heartbreaking and heartwarming stories pouring out of the aftermath of the bushfires. The one that really got to me was I was watching the news the other day, and a reporter was telling how they had gone into one of the towns and the first lady they’d come across the day after the fires was a woman standing barefoot and shocked in front of the twisted and burnt ruins of used to be her house. Jebers, it makes me a little teary even jsut typing it out. Needless to say when I heard it, I burst into tears. It was that point that I decided that I had to do something. Like so many others, t he need to help was just overwhelming. So many people are helping in their own ways, and in their own specalities. And I’m making dolls for the children who have lost everything and seen so much horror. 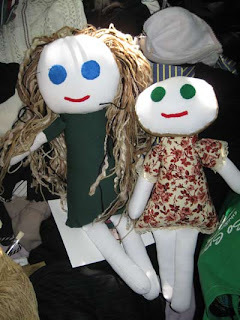 They’re big dolls, much bigger than I usually make, between 50 and 60cms. I think it’s important that the dolsl are big enough to cuddle and give comfort. I had a think about the materials and hair colours and I’ve stayed away from black, reds, yellows and oranges. I didn’t want to cause any more hurt and remind them of the massive fires they’ve seen. So each will have brown hair and they have greeny or blue coloured dresses. They’re vaguely based on the Black Apple dolls I’ve seen, because I wanted to be able to make as many as possible as fast as possible, so making the bodies and clothes as one was the best solution. you can see two of them at the right. I love the flowered dress girl, I love the little frilly lace around her sleeves and the bottom of her dress (she’s not finished yet) I’m doing the hair from my tutorial, it’s using massive amounts of wool but it’s worth it, to give children something positive, and so I’m off to Lincraft today to buy more brown yarn, the first girl in green used up all my supplies! Meet Me At Mikes have voluenteered themselves as a collection point for all handmade goods, so as soon as these girls and their sisters are finished, I’ll drop them off. The responce has been incredible from the general public and from the internet community. It makes me proud to be a human being, surrounded by such generosity and caring.